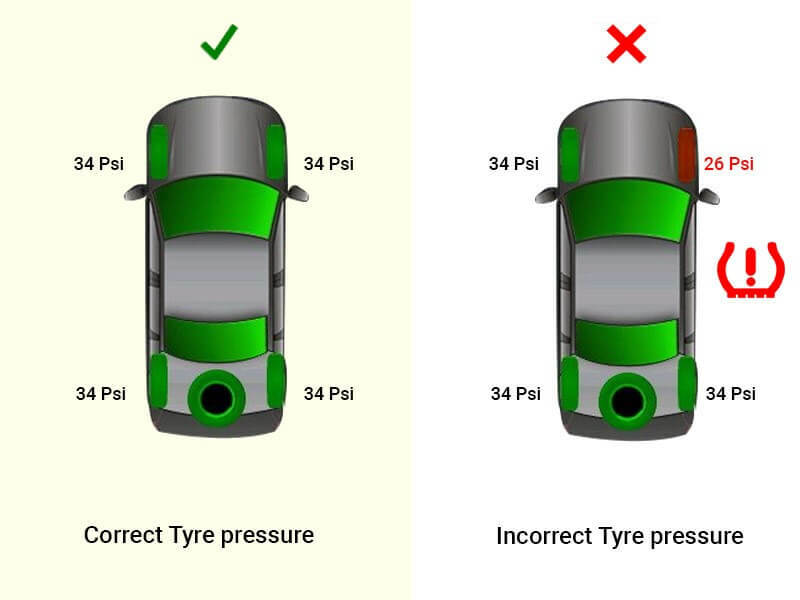 We all know how important it is to maintain the correct tyre pressure for safety and efficiency reasons, but how many of us really care to check the pressure regularly. According to AA roadwatch survey, Women are more likely to neglect their cars than men. Surveying more than 12,300 people revealed that a large number of motorists neglect to check their car’s tyres, fluid and lights on a regular basis. 1/3 of these people admitted that they rarely check their tyre pressure. To ensure that the vehicle runs on proper tyre pressure, most of the cars sold in India comes with factory installed Tyre Pressure Monitoring System (TPMS). If your car does not have this feature, then we would definitely recommend you to choose from the several options available in aftermarket. TPMS is an electronic system utilized to monitor air pressure inside each wheel and suggest the driver if it finds pressure difference between the four tyres. It indicates the driver by illuminating the tyre cross section shaped symbol on the dashboard with exclaimation mark in between. 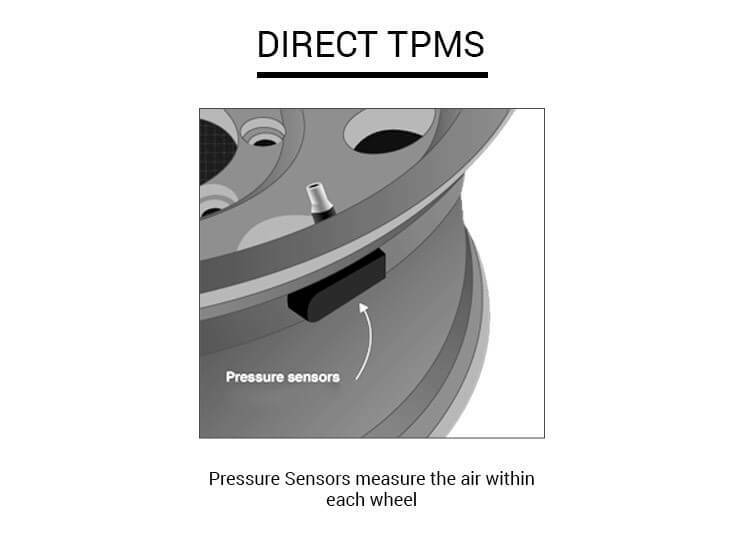 There are two types of TPMS systems, Direct (dTPMS) and Indirect (iTPMS).
. These sensors collect the data and sends it to the common control module that is connected to it wirelessly. Now this module compares data from all four tyres and alerts the driver if it finds low pressure in any tyre. Although the battery lasts for about a decade, if it is drained, then the whole sensor needs to be replaced. Indirect system does not have proper sensors inside the wheels, but utilises the pre-existing Anti-lock braking system sensor. The ABS sensor records the rate of revolution of each wheel, and an onboard computer compares the revolution data of all four wheels with each other. 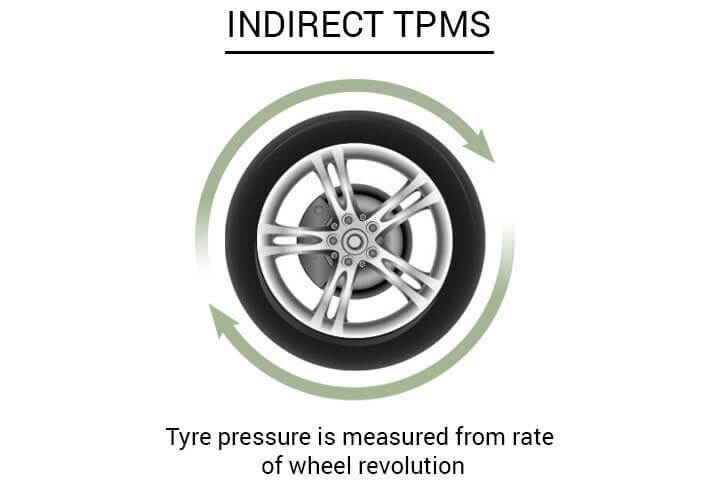 It works on a simple concept that if the air pressure of the tyre reduces, the overall circumference is also reduced. Smaller circumference means more revolutions for the wheel at a given speed. So, indirect pressure monitor does not exactly measure the air pressure but compares the revolutions of each wheel. If one wheel’s rpm is greater than the other wheels, then the system gives the low pressure warning. Although the convenience of the Tyre Pressure Monitoring System can’t be matched, it’s still a good habit to check your tyre’s air pressure manually.